1. Open the Ots file containing the song in Ots Studio by clicking on in the Toolbar. 3. A summary of the Beat Chunk can now be seen on the right-hand side. Click on the Edit.. button. 4. Click on the Auto Detect BPM/Range button. 5. Move the Intro Match Point marker in the Intro Range to the beat just after where the vocals say "Ya'll ready for this..this", which is 128 counts (32 bars) past the first beat. Note: Drag the Match Point marker using the Lower Waveform display. This method is easier when moving greater distances into the song. Tip: Hold the CTRL key while dragging the marker to snap to the beat markers in the Upper Waveform display. 6. Hold CTRL and double-click in the Upper Waveform display. Listen for the metronome playing in time with the beat. Click once in the Upper Waveform display to stop playback. 7. Hold CTRL and drag the Intro Range Start marker to snap to the first visible beat. 8. Hold CTRL and drag the Intro Range End marker 32 beats past the Match Point. Just as the beat starts again. 9. Set the Pre-NPI value in the Intro Range to 10. 10. Set the Post-NPI value in the Intro Range to 30. 11. Move the Outro Match Point marker in the Outro Range on the first beat where the vocals say "This..This..This.. ", which is 64 counts (16 bars) before the end of the song. Tip: Hold the CTRL key while dragging the marker to snap to the beat markers. 12. Hold CTRL and drag the Intro Range Start marker to snap to 64 beats (16 bars) before the Outro Match Point. 13. Hold CTRL and drag the Outro Range End marker just before the vocals "Ya'll ready for this" at the very end of the song. 14. Set the Pre-NPI value in the Outro Range to 50. 15. Set the Post-NPI value in the Outro Range to 0. 16. Check both Active - allow use checkboxes. 17. Click OK to exit the Edit Beat Info window, and save your Ots file by clicking on . 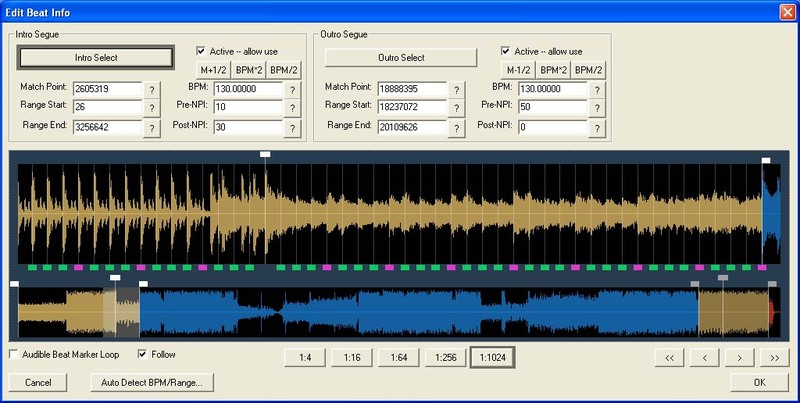 Get Ready For This 2006 [4Play Filthy Club Mix] by 2 Unlimited is now ready for Automated Beat Mixing in OtsAV. Your Edit Beat Info window should look like the one below.